Throughout her campaign for governor, Democratic nominee Sue Minter has said that, if elected, she would fix the state's struggling health insurance exchange. But at a debate Wednesday night in Rutland, the former transportation secretary suggested that she was willing to abandon Vermont Health Connect and move to the federal exchange. "If I learn from the independent assessment that the legislature funded that there is a way to move, I will move," Minter said, referring to a $250,000 study due to lawmakers in December. "If I learn that there's a way to complete and make the system functional, I will do that." At her first debate last month with Republican Lt. Gov. Phil Scott, Minter expressed confidence that she could make Vermont Health Connect "fully functional." In a written statement provided to Seven Days three weeks ago, she said she would "work to fix the investments that we have made" in the system. And as recently as last Friday, at a forum in Manchester, the Democrat "pushed back" against the idea of abandoning the exchange, according to VTDigger.org. Minter continued to express concern Wednesday that abandoning Vermont Health Connect could imperil the state subsidies enjoyed by some 17,000 Vermonters. But she appeared to open a door to a new approach, saying that she was "willing to transition off of this," if she could guarantee that those with subsidies wouldn't lose them. "I think Vermont Health Connect has failed many Vermonters and that Vermonters deserve better," she said. Scott, who has long criticized the system, continued to argue Wednesday that Vermont should move to the federal exchange — or one operated by another state — even if such a move carried significant upfront costs. "We put over $200 million in this dysfunctional exchange and it's still not working. It's just an improperly built foundation. It's never going to get any better, from my standpoint," the lieutenant governor said. "So sometimes you have to admit when you made a mistake. You have to stand up and do what's right. And I think it's long past time to pull the plug on the exchange and go to something different." The Rutland debate, which was hosted by VTDigger, came just hours after news broke that the State Department would send 100 Syrian refugees to the city later this year. The proposal has divided Rutland since it was unveiled last April. Pressed by moderator Mark Johnson, Scott said he continued to support refugee resettlement in the city — but he sure didn't sound like it. The lieutenant governor repeatedly criticized the process that led to Wednesday's announcement, referring to it as secretive and "flawed." Asked whether Rutland First, an anti-resettlement group, had raised "legitimate" concerns about the plan, Scott said, "Whether they're legitimate or not, I think they are questions that should be answered." "I just think we have an obligation to have a conversation about this — a transparent conversation," he said. "There's some legitimate concerns about what this is going to mean to Rutland — how much it's going to cost." Minter, whose own family hosted Meskhetian Turk refugees in her home, expressed wholehearted support for Rutland resettlement. "I will always keep Vermont's borders and our cities open to people fleeing war and persecution," she said. "I think that our country and our state is going to benefit from more diversity — benefit from the hard work ethic of the folks who are coming here and for how much they will give back to us." 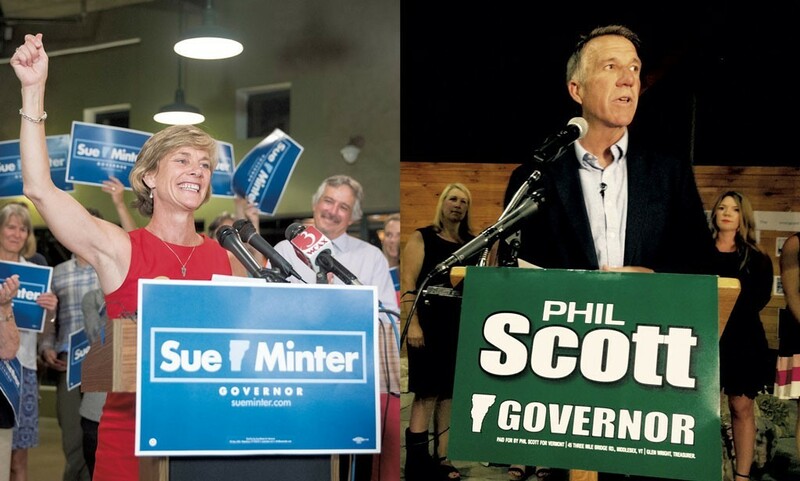 Later in the debate, Minter criticized Scott for his opposition to civil unions when he first campaigned for the Vermont Senate in 2000. As the Burlington Free Press' Jess Aloe reported Monday, Scott wrote a letter to the editor of the Barre-Montpelier Times Argus that April criticizing the legislature's creation of the designation. "It angers me that our state government feels the need to 'ram rod' the gay rights law in one session under the false pretense of political correctness," he wrote at the time. "Shame on them." According to a separate Times Argus story Aloe quoted, Scott said at candidates' forum that October, "It's not civil rights, it's special rights for a select group of people." At Wednesday's debate, the Republican nominee said his thinking had evolved in the years since. "Well, that was 16 years ago, Mark, before I was in the legislature. And, if you remember, those were difficult times for many. There was a lot of dialogue during that time. I would say that there's probably people in this room that were on opposite sides. But, you know, if I could go back and take those statements back, I would. Did I make a mistake? Sure, yeah." Scott noted that he voted in 2009 to legalize gay marriage, though he didn't mention that he first supported an amendment to put the question to a statewide referendum. And he didn't mention that he was absent for a vote to override former governor Jim Douglas' veto of the marriage bill. "I'm very proud to have voted in favor of marriage equality," he said. "We change. That's part of leadership, I think, is to listen and learn and then lead. And it's part of leadership to admit when you've made a mistake and do something different."